Today, by coincidence, I received several new toys simultaneously. 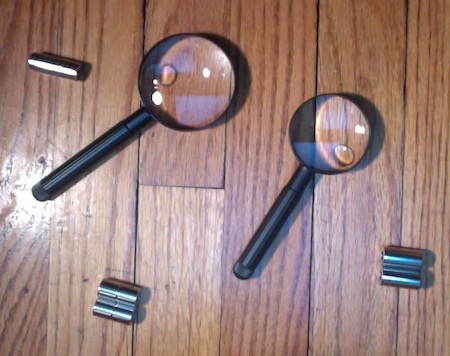 In the center are two magnifying glasses. The one on the left is 2.5″ in diameter and has a 3x lens. The one on the right is 2″ in diameter and has a 4x lens. Below the first magnifying glass are four ring magnets. Each is 1/2″ in diameter and 1/2″ long. They are kind of hard to separate. To the far right are two bigger ring magnets. Each is 1/2″ in diameter and 1″ long. These are very hard to separate. And if you do manage to separate them, don’t get your fingers caught between them when they try to snap back together. In the upper left, looking deceptively like a single long cylinder, are ten little ring magnets arranged end to end. Each of these is 1/2″ in diameter but only 1/8″ long. I’m guessing that these are the ones I’ll end up using my experiments. This entry was posted on Monday, August 26th, 2013 at 9:56 pm	and is filed under Uncategorized. You can follow any responses to this entry through the RSS 2.0 feed. You can leave a response, or trackback from your own site.